A warden notifying civilians of a possible gas attack. As it turned out, gas was never used in any WW2 air attack on Britain by the Germans. 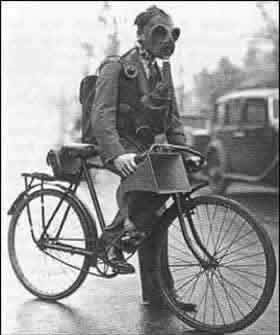 But, as this wouldn't have been know at the time, many thousands of gasmasks were issued to civilians. These included smaller ones for children, and special types for babies that totally enclosed them. It's hard to imagine what it would be like when those chilling Air Raid Sirens started up, knowing a bomb could demolish your house at any time.